I’ve been pulled hither and thither lately, have a number of nearly finished projects and the mess in my work area had gone from creatively releasing and exciting to mind numbing and confusing. So this morning I did enough tidying to let me work without constantly moving things around and the energy is already rising. Today is Australia Day and we’re going to visit friends soon for the traditional barbecue, but I have a little pocket of time to answer some questions from Vivian about the swedish lace sampler blogged here. Here’s a part of the threading, tie up and treadling. It was intended to create squares of pattern, but mine turned out rectangles. Just add as many pattern squares as you need for your piece. Warp and weft are 22/2 cottolin, sett 16 ends per inch. I didn’t record the on-the-loom measurements, but got around 10% shrinkage between off-loom and finished. I suggest sampling yourself before undertaking a large project. The finished sampler is 34.5cm wide (about 13.5 inches), with 5 colour stripes. It’s a nice, light airy cloth. I’d like it as a scarf. I haven’t woven a lot of towels (just the summer and winter ones, which are very thick), so don’t know if this would be suitably absorbent and sturdy. Certainly the fringe I used would have to go! 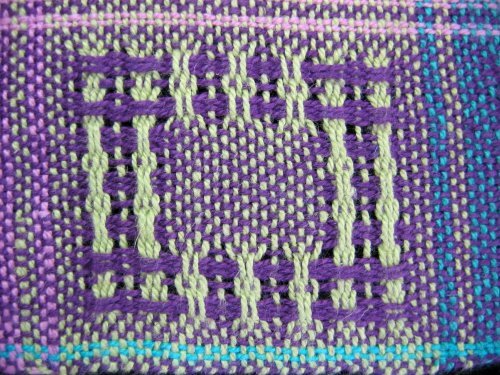 I’ve used this sampler quite a bit when planning other pieces, especially the interaction of two colours and the impact of similar or very different values (lightness or darkness, which seems to be more important than hue – green, purple etc). Vivian, I think towels in two colours would be lovely. I’m sure I’ve seen projects for tablecloths like that. Good luck with your project and weaving group. 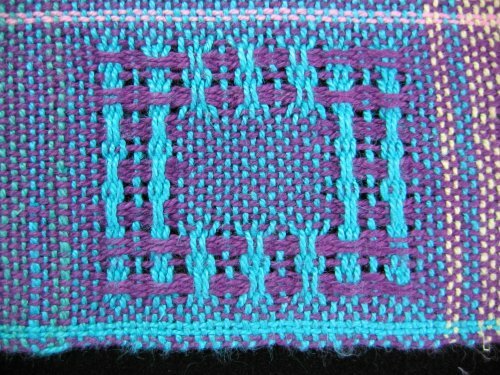 Trapunto commented to my last post about how useful a sampler can be – “8-shaft twills, how boring and cluttered a photo from a certain treadling can look in a book … turn out to be very interesting and definite in person”. I can only agree – there are well over 100 different patterns in that twill sampler, all with potential for development, and that’s before you bring colour and yarn choices into play. I don’t have time to dwell on those possibilities just now, it’s on to the next sampler. However I am happy to report that this will bring me almost up to date, after a hectic month focused on activities other than weaving and blog reading/writing. Today’s sampler is fresh from the loom yesterday and the ironing board today. 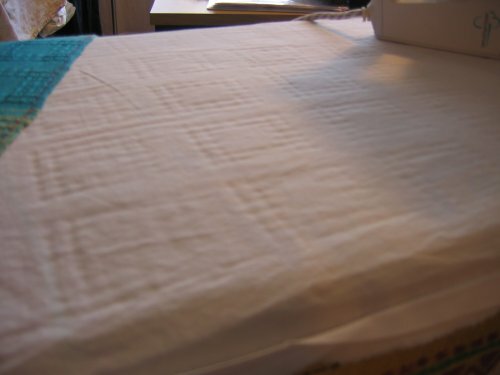 In fact the cover on the ironing board still bears its imprint. 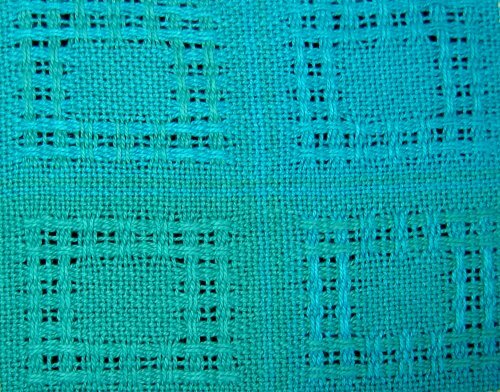 Swedish lace is mostly plain weave, with areas of floats (warp and/or weft) that move when you wash the cloth to give an open, lacey, textured effect. You can’t see much of this on the loom or before it’s washed. This sampler is probably easier to see than most since I decided to make it a colour experiment (how out of character! ), rather than the more traditional cream or white. The yarn is Cottolin – 60% cotton, 40% linen. You can see the impact of finishing (a vigorous handwash in hot water ). For the “after” photos I put a black cloth underneath to show up the holes. There was 9% shrinkage between just off the loom to finished size. During washing, the 2 floats sit up a bit and the 3 plain weave threads snuggle together underneath. 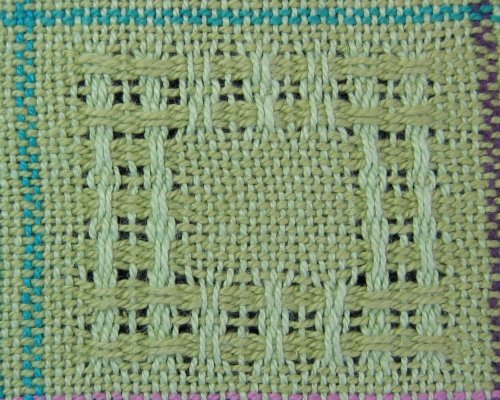 You get some texture from the floats up top and spaces either side (before weft 1 and after weft 5) because of the snuggling. There’s a “normal” thread between each set of 5 to give a bit of structure and hold things together – which gives the little “window pane” cross thing. Plus you can use a similar idea with warp floats instead of weft floats. 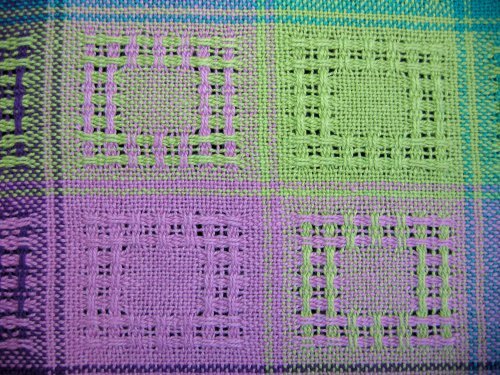 This photo shows a combination of purple warp floats and turquoise weft floats. This was a 1st year, 4 shaft project. 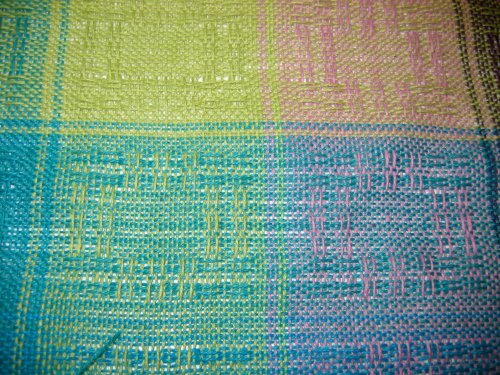 I decided to make colour experimentation my focus, partly because I’m on a colour jag and partly influenced by the March/April 2008 issue of Handwoven – especially the Beginners Corner section. 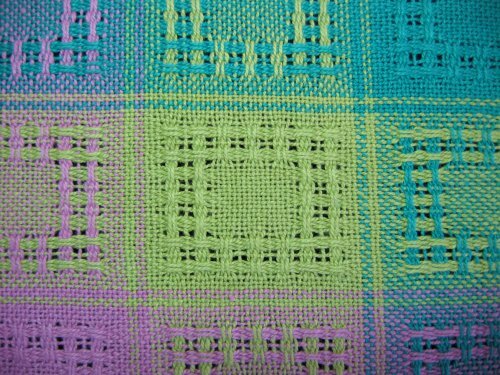 I kept the actual weaving design simple and (I believe) traditional – a mixture of both warp and weft floats on the face, plus plain weave so that I got all the possible colour mixes. I was interested in areas of pure colour and areas where warp and weft colours combine. I was also keen to try for an iridescent effect by using two very close colours. On my monitor this photo is just a fraction brighter than life. 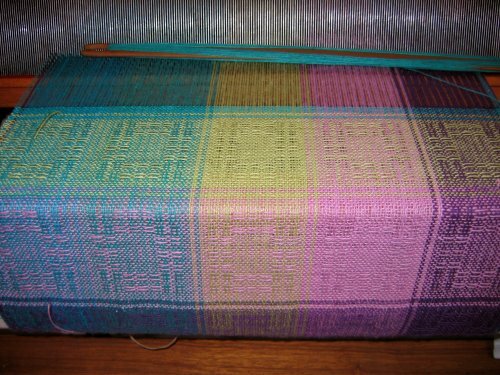 Bottom left corner is green warp and weft. Top right is all turquoise. Top left and bottom right are combinations – in my opinion, in real life, more interesting. The two light greens might be easier to see, and also very attractive “live”. In fact I like most of the combinations, the subtle and the more extreme, so I’ll show a couple more. More detail on this project here.